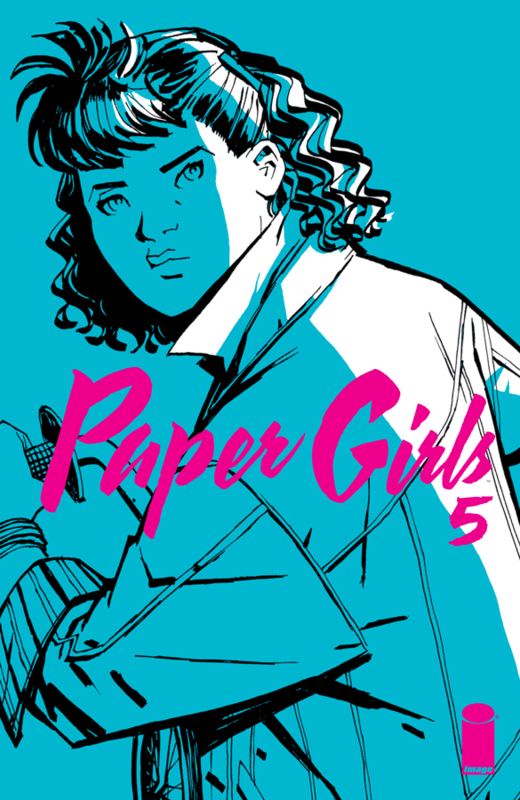 The shocking thing about 'Paper Girls' #5 was that I enjoyed it despite not being able to understand half of it. Brian K. Vaughan is riding with house money going into this conclusion of the first arc with engaging characters and a mysterious alien invasion. It also has the benefit of Cliff Chiang's extraordinary art but unfortunately, we're not much further along in the story or as invested in the paper girls as we once were. That's not to say Vaughan is phoning it in, he's not it's just that he's chosen to let action guide the plot and character development has taken a back seat. The girls, in particular, have stopped being developed and being distinctive. The issue opens with a nice creative touch, seeing things from Erin's first-person perspective as she recovers from her injuries. Heck and Naldo are in their Whenhouse, a sort of storage facility for the tech they scavenge from time traveling when they stop to check on Erin. Their unorthodox medical treatment has helped her heal and now are trying to get her back to 1988 but things take a turn for the worse. Meanwhile, Mac, Tiff, and KJ feel threatened by the alien woman Cardinal and the half-chicken/half-pterodactyl she rode in on. Some contrived circumstances allow them to escape which displeases Cardinal's boss, the body snatching overseer called Grand Father. Up until now their motives haven't been made clear. Well, they're not made completely clear here either but mostly inferred as to the what they're up to but we're still missing the why, who, and how. These are pretty important questions five issues into a new series. Chiang continues to do his usual awesome pencilling while Matt Wilson provides magical colors mostly in pinks, blues, and purples. This is a professional looking comic book in every sense of the word. The layouts are efficient and well-paced. The character designs are full of life with expressive faces and body language. The art is not a problem whatsoever. We may expect too much from such a talented group of comic book creatives. We've become accustomed to being wowed with every new title. When things like character development stalls and motives become unclear it can be a little jarring to see titans of the industry falter a little bit. Yet, 'Paper Girls' offers a series-saving twist as its cliffhanger and the book is still a fun ride as long as you don't ask where you're going or why.